Since it’s Halloween, I thought a little post about Shirley Jackson would be appropriate. Called “that patron saint of oddballs” recently by Salon, the contradictions of Shirley Jackson are perhaps best summed up by her final, unfinished work, Come Along With Me. Although The Lottery is an amazing short story that broke the minds of New Yorker readers when it was printed, and The Haunting of Hill House is a fan favorite novel, I think her oeuvre is too often defined by these particular works. Usually she wasn’t half that dark, even while dealing with eerie and sometimes supernatural themes. Come Along With Me, the last thing she wrote, is as good a place as any to try to understand what I mean. The novel fragment is narrated by an unnamed woman who claims to speak with spirits. She arrives in a strange boarding house wanting to perform a seance and is accepted only with suspicion by the people of that place. She is an outsider, the stability of her psychology is questionable and her place in the community is far from certain. Woman, outsider, maybe crazy: These are traits she shares with almost all the Jackson heroines; they’re all a bit like good-humored versions of Sylvia Plath in The Bell Jar. And from their gently tilted perspectives we’re given a unique view of mid-century American society. He looked at me; I must say I like it better when they look at you; a lot of the time people seem to be scared of finding out that other people have real faces, as though if you looked at a stranger clearly and honestly and with both eyes you might find yourself learning something you didn’t actually want to know. That’s the kind of perspective you find from Jackson, something utterly true and strange. Her stories shiver with an unreality that reveals the inherent complexity in even the most ordinary activity and then imbues it with bizarre connotation. I love this cover, although it doesn’t reflect the book. Fleming comes across unpretentious and thoughtful as he tells Chandler about how he dashes off a new Bond novel in two months every summer, and then admits that that doesn’t contribute to the quality of the work. He calls Chandler the superior author and when Chandler demurs, Fleming proves his point with a surprisingly insightful commentary about what makes his writing work as entertainment and what makes Chandler’s writing a deeper examination of character. My favorite moment though has to be when Fleming claims that “James Bond I never intended to be a hero. I intended him to be a sort of blunt instrument wielded by a government department who would get into bizarre, fantastic situations and more or less shoot his way out of them.” Put like that, 007’s adventures sound like a cold-war commentary as much as the spy fantasies they more clearly are. Although his novel, Under the Volcano, was featured last year in Esquire’s 75 Books Every Man Should Read, I have only ever met three people — male or female — familiar with Malcolm Lowry. Two of them thought he was a genius, and the third a misanthropic degenerate. I probably never would have heard of him myself if I hadn’t lived in Kazakhstan for a year. There I was limited to a diet of library books, very few of which were in English, and one of which happened to be the posthumously published short novel, As Dark as the Grave Wherein my Friend is Laid. I picked it up purely based on the title. They also had a copy of Hear Us O Lord from Heaven Thy Dwelling Place and his more modestly titled first novel, Ultramarine, and I absorbed those, as well. However, it wasn’t for some years that I finally got my hands on Under the Volcano. This was before the Internet, and finding editions of obscure, out-of-print authors was a bit of a scavenger hunt. Nowadays, not only are used copies of Under the Volcano a mouse click away, but it’s also readily available in nifty new edition. An atmosphere of difficulty cloaks the book like the thunderheads that hide the “immense flanks” of Popocatepetl, one of the two volcanoes in whose shadows the doomed alcoholic consul, Geoffrey Firmin, his estranged wife Yvonne, and his half-brother Hugh confront their fates. First published in 1947, Volcano had the troubled early life typical of unique books. It sold well in the United States, but in Britain it was remaindered and in Canada, where it was written (Canadians are proprietary towards Lowry, who spent the happiest period of his life there), it sold only two copies between the end of 1947 and 1949. Its reputation grew over the years following Lowry’s death in 1957, but it remains a book that deeply divides opinion. Not because of the book’s “what,” which is fairly straightforward, but its “how”: tangled time schemes and a Faulknerian stream of consciousness are just two of the prominent challenges with which Lowry tests readers. Nevertheless it is well enough loved to have inspired a John Huston film starring Albert Finney, and lent its name to Creative Writing Workshops in Tepoztlán, Mexico and to London’s Original Mexican Restaurant. (And a lot more than that, actually.) In fact, In 1998 it was rated as number 11 on the list of the 100 best novels of the 20th century compiled by the Modern Library. The New Yorker featured a fascinating retrospective on Lowry’s life and work a few years ago. I recently spent more than a week in Key West, Florida. A writer friend told me, half seriously, that he was “jealous of your pilgrimage” and another said, “Cheers to Papa!” And, yes, while I was there I made a visit to the Earnest Hemingway Home and Museum. 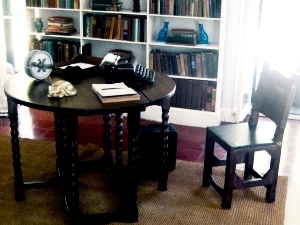 A view of the desk in Hemingway’s writing room. Although inundated with tourists, the place is kept in excellent repair and simply dripping with tropical grandeur. Most importantly, for me, the writing room above the shed is decorated in a manner that it might have been at the time when he was there writing To Have and Have Not. The rest of the house is more of a record of the tastes of his second wife (and rightly so, considering her family money paid for it and that she continued to live there after he’d left for Cuba with his third wife). Still, it’s neat to see, especially all those mutant cats. Of course, I have no idea what the house really looked like in the 1930s. For example, they tell you on the tour that Hemingway kept a boxing ring in the backyard until his wife replaced it with a swimming pool while he was in Spain with his mistress. But the house itself is gorgeous, and steeped in history. And all in all, I enjoyed it just as much as any of the historic homes of writers that I’ve visited. Ever since I was a kid, I’ve enjoyed visiting writer’s historic residences. Growing up in the Valley of the Moon, I used to visit Jack London’s Wolf House, or what’s left of it, all the time. I’ve also been to the homes of Russian writers. And in Massachusetts I made sure visit to the Poe House and took in the Longfellow House-Washington Headquarters, which is really an amazing place to tour. All these houses are very different. The only thing they have in common being that a writer did his work there, and it’s nifty to get an idea of where they sat and what they saw out the window. In the ongoing process of becoming a writer, I read and re-read authors I most loved. I read for pleasure, first, but also more analytically, conscious of style, of diction, of how sentences were formed and information was being conveyed, how the writer was structuring the plot, creating characters, employing detail and dialogue. … What writers know is that, ultimately, we learn to write by practice, hard work, by repeated trial and error, success and failure, and from the books we admire. I agree very strongly with this. Where I begin to be concerned is in her analysis of specific examples, and not any one of them but rather the whole way she discusses close reading. She breaks her book into chapters covering Words, Sentences, Paragraphs, Narration, Character, Dialogue and other elements of fiction, but her examples and the way she unloads these examples are, or seem to me to be, rather pedantic. I don’t feel I learned much about reading or writing. Rather it was all about analyzing. One of the fundamental problems with Prose’s approach is that we must depend on her to summarize the story up to that point or beyond so that we can make sense of what she’s doing. Even if we’ve read The Great Gatsby (it’s been since high school for me), it’s unlikely we could focus on the particular point without Prose’s attentions. She’s urging us to be brazenly intimate with a text while forcing us to rely on her introductions. It’s clear that the approach works much better in the context of a classroom, where the focus is on one story or one book, and it might have been more effective in Prose’s book if one text had been the focus of each chapter. Prose could have more closely replicated the pedagogical approach she employs in the classroom, and we would have been far less likely to misplace our own enthusiasm for the text—or our respect for her skill in unpacking it—in the abundance of illustrations. If the technique is developed in the classroom and requires a classroom to explain, then Prose isn’t talking about how a writer reads so much as how a professor reads. I never simply enjoy the act of reading anymore. My authorial intelligence is totally and fully engaged. When I read, whatever I read, I examine and analyze. This is partly in order to judge the artifact and rank it, but also, and perhaps mostly, I am doing this so that I can learn from it. I want to know what I can appropriate. You could say – in fact, I will say it – I read primarily to steal. This attitude applies not just to books but to everything. In every situation, whatever it is, whether private or public, personal or impersonal, happy or sad, interesting or boring, exotic or quotidian, while part of me is involved and interacting and apparently sympathetic and human, there is another part of my personality that is scrutinizing my experiences and thinking two terrible things: What’s in this for me? And: Can I use this? Can I put it in a story? Can I put it in an article? Gébler is no longer learning from reading so much as, in his words, cannibalizing. He blames the marketplace for forcing him to evolve from an “author” into a “writer and teacher.” He is bitter, but Prose seems mainly positively about the transformation. I suspect the truth is somewhere in between. I have been reading Dostoevsky again. Notes from Underground was one of the few books they made me read in high school that I actually enjoyed. Something about the sheer pessimistic misanthropy of his underground man was so very appealing to my tortured teenage sensibility that I went on to read Crime and Punishment with great relish even though it wasn’t technically assigned. As a teenager, I was too intimidated by the length of his other works to delve in, but then, while I lived abroad, I came across his short stories. They struck me as hilarious! Particularly the one about the dog-murdering cuckold paranoiac. Then I read House of the Dead (which I assure you has nothing to do with the video game or Uwe Bol flick). I found his worlds so vivid and his philosophies so profound that by 25 I had churned through The Brother’s Karamazov, The Idiot and The Possessed in a fever. It was only when I tried to read The Double that I finally faltered. 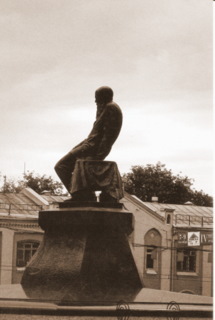 There is an interesting piece about the tides of his literary reputation over at the Guardian‘s Book Blog that points out that The Double just about ended Dostoevsky’s literary career, so perhaps I’m not alone in being unable to read it. I haven’t attempted a Dostoevsky novel since then. But the other day I picked up The Gambler because it’s relatively short, which made it seem doable. Turns out it’s all about obsession, and filled with smears against the French. I suspect I will finish it. I’m already half way and I hate to leave a book unread. And then perhaps another run at The Double? No promises, though. Maybe I will just reread those hilarious short stories. If you’re not familiar with Paolo Bacigalupi, then allow me to make the introduction. He’s the author of the excellent and highly critically acclaimed novel The Windup Girl. I got my own introduction to Bacigalupi only recently through the io9 book club. If you visit the book club’s ‘ask Paolo‘ page you can see where I questioned him about how he plotted his intricate, multi-character novel. (Actually, what I said was “Where did you start?”). And he explained that plotting was indeed a challenge. “One of my big concerns about the book was that it didn’t have an overarching plan or structure to guide it for a long time. I just kept writing drafts until the elements that interested me seemed to bind together,” he told me. It’s a process I know a lot of writers can relate to. In an interview posted Monday at Techland, Bacigalupi decribes writing as a “try, fail, learn cycle. You have to be able to take that again and again. And those failure moments, you have to go, OK, why did I fail? What did I learn from this? How can I reapply this and go again?” Words to live by, if you ask me.